Nowadays our homes are much more secure. We have double glazed windows with strong locks, sturdy multi-lock point front and back doors and other security measures in place such as alarms. This often makes places like the garage more likely to be a target for potential burglars. Why? These locations are sometimes less well guarded. They can have flimsy doors and locks that haven’t been updated in a while. Many homeowners don’t use their garage to put the car in. Instead it’s used as an ad hoc storage space for things like garden tools and equipment as well as bikes and other property that need to be kept secure. One of the key areas of weakness, for example, are garage door locks. They can be low quality in older structures and easy to bypass when you understand how they work. The important thing is to review your security regularly and look at the best ways to improve it. This might sound obvious but you’d be surprised how many people leave the garage door open for all the world to see. This can happen when you’re doing jobs around the garden or perhaps getting your bike out for a quick ride. Strong garage security means being aware of what thieves are looking for. Leaving your door open too long simply acts as a magnet. Not only does it give burglars the opportunity to see what treasure trove you have inside, it can prompt spur of the moment attacks on your property. Once you have finished with the garage, pull the door closed and lock it. That includes when you are simply popping down the shops on your bike. Don’t leave it unguarded. This area is more open to the elements than some other parts of your home, so it pays to give it the once over at least every 6 months or so. Check that the frame is sturdy and there is no rust or wood rot. Push at the door to see how easy it is to shift. If you have an up and over garage door, you might want to think about switching this for a more secure roller style or even a sectional door. These are generally considered highly secure and the latest models come with strong, quality locks. Automatic doors nowadays have high levels of security with locking at multiple points. You may not have enough money to fully replace your garage door in which case you might want to look at simply replacing the lock. While this is not ideal if you have other security issues, it’s better than not doing anything at all. A qualified locksmith should be able to work with you to find a lock that meets the latest EU security standards. They may also be able to recommend other garage security devices such as door defenders. This is anchored to the ground and prevents the door opening even if someone manages to break your lock. You should always go for a quality product and get it professionally installed if you want it to be really effective. The good thing about a door defender is that it also acts as a deterrent for any potential burglar. If you have a rear door and window, these can be of particular interest to thieves, especially with older types of garage. It can be easy for them to break in via these areas of weakness, so checking that your door and windows are sturdy and have good locks is important. You might want to think about filling in the window area completely if you think this is too much of an attraction for passing burglars. Another way to add a layer of security is to put in cameras or have motion sensitive lights set in place. These can act as a deterrent as most burglars don’t like being watched or put under bright lights. It also sends the message that you take your security seriously. One item that is stolen more than any other from garages around the UK is the bike. It’s easy for thieves to grab, jump on and ride out on. 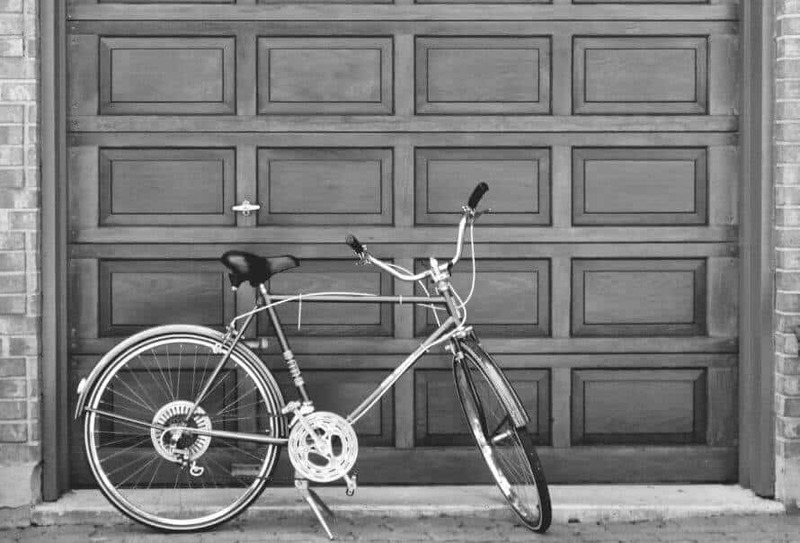 While you may have great doors and locks in place, it makes sense to ensure that your prized bike is secured inside. There are plenty of ways that you can do this. Ideally, you want to make it as difficult as possible for any burglar to disable the lock and steal your bike. Our tip here is not to compromise and go for a cheap security option. Spending a little extra can save you a lot of trouble and anguish in the long run. Get either a ground or wall anchor lock to secure the bike lock to and ensure you install it correctly. If your bike is just locked with a chain and not to an immovable object, it’s easy for the thief to pick up and remove – attaching it securely to the floor or wall makes it a much more difficult job. We suggest that locks/anchors have been validated by Sold Secure (preferably gold rated). If you haven’t thought about your garage security, it’s probably high time that you had a good hard look at this area from a thief’s point of view. The truth is that, if you can find weak areas, the chances are any burglar will be able to as well.